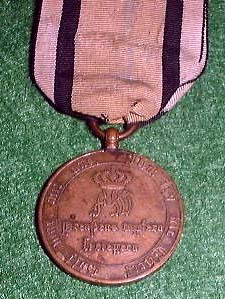 At the urging of a fellow member, I would like to present a thread dedicated to the Napoleonic era awards of the Imperial German states. We often feel a comfort level by concentrating on World War I and then, to varying degrees over time, work our way back through the Colonial and African campaigns to the Franco-Prussian War; but rarely go further than the war of 1866. 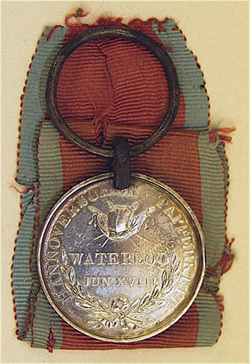 The Napoleonic era awards reflect things that were to come. Some of the states and entities of that time (Anhalt-K?then, Hannover, Hessen-Kassel...) no longer existed, as such, by 1870; but their influence often lived on. From here, we work our way forward - it is hard to know where you are going, if you don?t know where you have been. Because of the extended time period and the relatively low number of awards, coupled with the fact that a comparatively low number of awards even existed at the time, these awards tend to be rare. 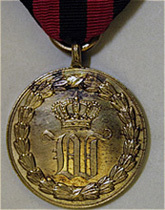 Most of the orders which we admire so much were founded after this time; and, for the most part, the concept of civil merit medals, lifesaving medals and and long service decorations was yet to be embraced by all. So, I would like to invite all who have the interest and good fortune to have any of these decorations to share them with us. 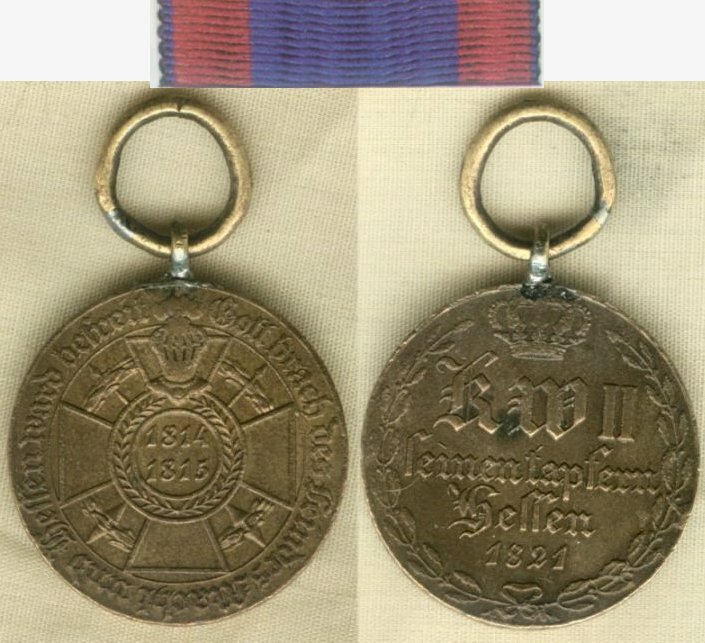 I will start with a Hannoverian Waterloo medal; Hannover being one of the states which ceased to exist by 1870 - having been on the losing side in the War of 1866; and subsequently being absorbed by Prussia. 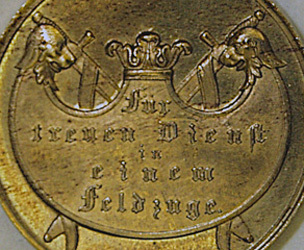 This medal, shown with a piece of original ribbon, was awarded to Soldat Johann Herwig of the Landw. Batt. Muenden. 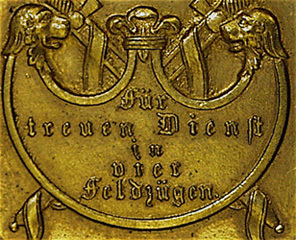 This reflects a nice feature of Hannoverian medals - the recipient?s name and title or military unit is impressed on the rim of the medal. 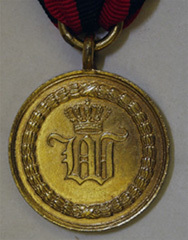 This example has what is probably its original clasp and suspension ring, which is very rare. 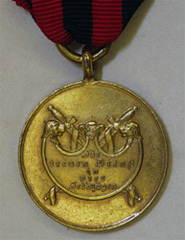 This clasp arrangement just did not hold up over time (especially in the case of recipients who spent time bouncing around on horses); hence the vast majority of these medals sooner or later wound up with replacement suspension devices, the variety of which really runs he gamut. glad to see this here wild card. there is so much heraldry that is based in these early times. by comparison to such entities as the blue max. almost blank page, but one waiting to be colored in. i can, and watch with interest the material that follows. looking forward to the pursuit of this area! I posted this before on another thread, but might as well do it again. The Hesse-Kassel 14/15 KDM. 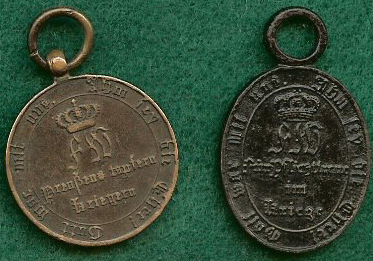 Reverse of the pair. No ribbons, Combattant bore the usual rim inscription "From captured guns"
The Case they came in from Germany. Typical pre-1900 style construction. Made by recipient? Made by collector? We'll never know. Sorry, older fuzzy photo. Bought that one in 2002. 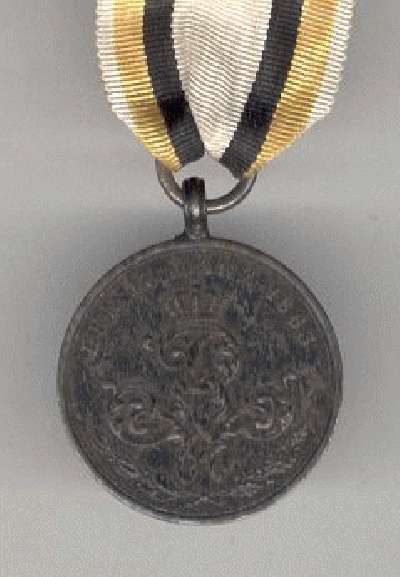 I will refrain from adding the 1813 EK2, let's keep this to campaign medals! 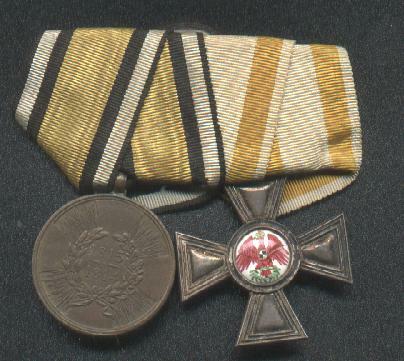 Since the concept of hanging a medal from a piece of ribbon was relatively new, it took some states longer than others to adapt sensible suspension systems. 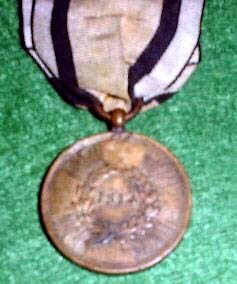 Here is an Oldenburg 1815 Military Merit medal - an example of how not to do it. Tom Y and Stogieman, both of your examples defy the ordinary in that these old cannon bronze medals most often develop black rust splotches. Tom?s medal shows the beginning of a small one; but not really detrimental. Won?t go into how rare ribbons of the period are; hang on to that one - at least the ribbon. 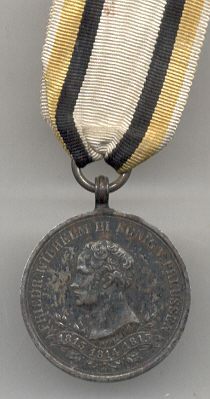 Around 1830-40 several German states instituted retroactive awards to the surviving veterans of the Napoleonic campaigns. States falling into this category include Anhalt-Bernburg, Baden, Hannnover and W?rttemberg. 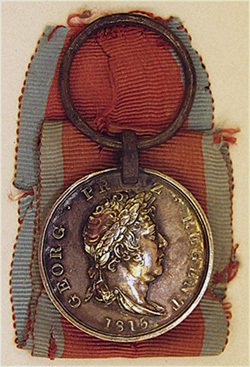 Below is an example of the W?rttemberg medal for the campaigns of 1793-1815 which was founded in 1840. 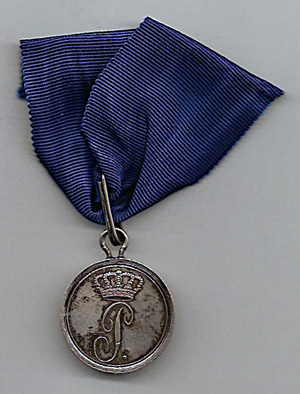 The medal was awarded for the specific number of campaigns in which the recipient participated; ranging from one to twelve or fourteen (depending on the source). Obviously, rarity varies with the number of campaigns. There are two distinct obverse and reverse patterns; which is probably the result of replaced dies. The example below which is for four campaigns has the type 1 obverse and type 1 reverse. 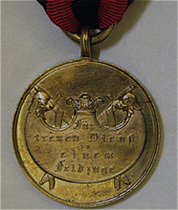 According to "Die W?rttembergischen Medaillen von 1797-1864" by Klein and Raff, this medal came as shown as well as with the type 1 obverse and type 2 reverse. 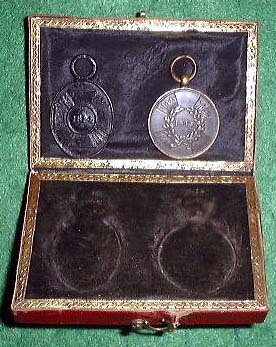 From six campaigns up all medals had the type 2 obverse and type 2 reverse. 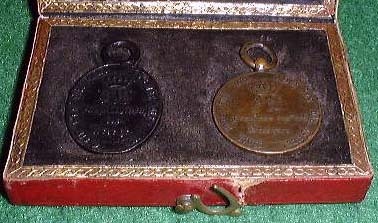 The combinations for one, two and three campaigns get rather complex, especially when the reverses with and without the period at the end of the inscription are added to the mix; again, replaced dies (?). Greetings WildCard! Thanks for that little detail, I did not realize there were that many variations!! 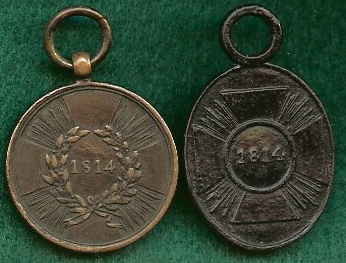 For comparison, following are pictures of a medal for one campaign which has the type 2 obverse and the type 2 reverse.